The Ulimate Ears BOOM wireless speaker (see earlier post) was a big hit at my Holiday Gadget presentations this season, demonstating clear and clean sound even in large rooms. But there's more -- the new UE MEGABOOM boosts the sound to fill multiple rooms, and doubles the Bluetooth range to 100 feet (30 m) so you can keep playing and listening even as you wander to different rooms or even upstairs. The MEGABOOM has the same basic design as the BOOM -- a cylinder radiating 360 degree sound. It's bigger and heavier, growing from around 2 1/2 x 7 inches to 3 1/3 x 9 inches, and in weight from 19 to 21 ounces (still under 2 pounds). The MEGABOOM also steps up its two drivers from 1.5" to 2", with two 2" x 4" passive radiators, boosting the maximum sound level from 88 to 90 dBA and extending the lower frequency range from 90 to 65 Hz. The other advantage of the larger size is a bigger battery, so the MEGABOOM can run for 20 hours (up from 15) -- and yet it also charges faster (in 2 1/2 vs. 3 1/2 hours). Both BOOMs are rugged enough for outdoor use, shock-resistant, and constructed from a water resistant acoustic skin, with an IPX7 rating for resistance to exposure to rain, snow or splashes of water. To play from your smartphone or tablet or even laptop, you can pair up to 8 Bluetooth devices, and connect up to two source devices at the same time (or use NFC with Android). And they support a Double Up mode to use two speakers (BOOMs and/or MEGABOOMs) to play in stereo or to double the sound. Download the app to control Double Up mode, customize the sound with a 5-band equalizer, or enable a musical alarm. The UE MEGABOOM is priced at $299 (vs $199 for the BOOM), and is available in black, red, blue, and plum. Typing on a tablet screen is OK in short spurts, especially if you're a fan of typing with one or two fingers -- while you carefully watch to target the key shapes on the flat screen. Adding a wireless Bluetooth keyboard lets you type more naturally for longer sessions, as long as you carry the keyboard along with your tablet. And then there's another clever approach -- the Touchfire screen-top keyboard. This is a thin silicone overlay embossed with the key positions that lays across the bottom of the screen, over the displayed keyboard. The keyboard is transparent, so you can see the keys (letters or special characters). And the Touchfire keys are tactile -- they have enough structure that you can rest your fingers on the home row without triggering the touchscreen, so you can get back to touch typing. The keyboard weighs 3/8 ounce, and is as thin as two credit cards. It can be folded and streched, and is waterproof for easy cleaning. Touchfire started as a Kickstarter project in 2011 to develop the original keyboard overlay for the early iPads, with magnetic edges and clips to attach to your keyboard cover when not in use. More recently, Touchfire has designed a line of cases for the various iPad models that better integrate the keyboard. When you open the case, you can hold down a tab to keep the keyboard on the screen, or let the keyboard stay magnetically attached to the cover and fold up out of the way. The case itself is snap-in, with a magnetic cover that turns the iPad on and off. The cover folds into different positions for low or high typing and viewing angles. The case itself is made of a grippy and durable silicone rubber. As a bonus, the magnetic case lets you stick your iPad on a refrigerator or other metal surface. And there's a speaker redirector scoop that boosts the iPad's volume to the front by some 50%. The Touchfire keyboard is a clever idea that may make sense if you do a lot of typing over a day, and yet don't want to carry around a separate keyboard. The Touchfire case is available for $69 for the iPad Air 2, the iPad Air, the iPad 2,3,4, and the iPad Mini, in blue, red, black, or light gray. The original Touchfire Keyboard for the iPad 2,3,4 also is available for $39. The Kingston MobileLite Wireless G2 is a great update to the original G1 model (see earlier post). You can use it with your personal data to copy and move files between computers and your mobile devices and backup your mobile files (and photo roll). And you can use it to share your media collections or files -- simultaneously sharing photos or documents with eight users or even streaming file HD movies. The MobileLite G2 has two ways to access data, a SD card slot for reading memory cards (including smaller microSD cards with an adapter), and a USB port for reading USB flash drives. This way, you can pull a SD card from your digital camera, or load files from your laptop on a USB drive, and then access one or both on your portable devices. The MobileLite also has a microUSB port that you can use to connect to a computer to use as a media reader. But the core use for the MobileLite is a wireless reader, so it has a built-in Wi-Fi hotspot so that you can connect to it from your mobile device and then use the MobileLite app to view and transfer files. To access the MobileLite from your device, select it from the Wi-Fi settings. However, this means that you will no longer be connected to the Internet. No problem -- the G2 has a second Wi-Fi radio that you can set to connect to your home Wi-Fi, so you can access files from the G2 and still browse the Internet. The G2 also is mobile, with a built-in battery that can provide up to 13 hours of continuous use. Or you can use it as a 4640 mAh portable power pack to charge a smartphone up to two times. The G2 also adds an Ethernet port that you can connect to an Internet cable (e.g., from your home or hotel router) and use the G2 as a mobile router to extend the wired Internet signal as a shared Wi-Fi connection. This is impressive flexibility, which is realized through the free MobileLite app (for iOS, Android, and Kindle). The MobileLite app is wonderfully well designed -- clear, staightforward, and consistent in its use. The main screen connects to the MobileLite over Wi-Fi and displays thubnails of files stored in the three possible storage locations: external SD card, external USB drive, and Offline (local storage on your mobile device). You then can browse each of the three file locations, sort by attributes, search, and directly view individual files and play media in common formats. Plus you can manage files, rename and delete files, and create folders. Or select one or more files to move or copy between different devices, between SD and USB, or between the external storage and the local storage on your device. You also can use the built-in iOS features to access and copy files between applications, using Open In to transfer a file to another app, or from other apps to the MobileLite app. For photos and videos, you can copy (and backup) selected photos or albums from the Camera Roll. The Kingston MobileLite Wireless G2 provides a welcome bridge between your mobile devices and your larger collections of files and media. You can transfer and save and backup your own files, and share photo collections or important documents with a group. Plus the built-in Wi-Fi and Ethernet connections extend the bridge to the Internet so you can work locally and access the Web at the same time. The Kingston G2 is about 5.08 x 3.11 x 0.76 inches and just over 6 ounces, and is available for around $31. The Kingston MobileLite Wireless G2 (see previous post) is a great solution for sharing and transferring files and media between your mobile devices (smartphones and tablets) and removable storage (SD cards and USB flash drives). But if you need to share lots of files with multiple mobile devices, then you may be even more interested in a large-capacity Wi-Fi disk drive like the Western Digital (WD) My Passport Wireless. This is a full-up USB 3.0 hard drive with up to 2 TB of storage. Plus it includes a SD card port for additional removable storage (e.g., to read photos from your camera). To load up the disk, you can connect it directly to your computer over USB 3.0 to copy files at fast transfer rates. It transfers at up to 5 Gb/s over USB 3.0, and up to 25 MB/s with SD cards. For example, you can load favorite movies for the kids to enjoy on a trip, photo collections that your family can browse and download, and/or documents for a group to review. Then you can connect to the drive over Wi-Fi with up to eight devices (handheld or computers) to browse its contents to view and transfer files, or you can stream up to four HD videos at once. Plus it has a second wireless radio to connect to your local Wi-Fi connection, so you can access its content and still be able to bridge to the Internet. WD also adds some additional useful connectivity options. You can enable access through the second home Internet connection, so devices on your local network can also connect to it as a NAS shared drive. You then can enable the drive as a media server, and stream videos, photos and music to connected TVs, media players, gaming consoles, and other DLNA/UPnP devices. The drive also supports FTP transfers, which is useful for mass copying and syncing files, and also can be used to transfer directly from wireless cameras. WD provides a nice dashboard interface for configuring the drive through a browser (or you can use the My Cloud app on a mobile device). You can check the storage usage and battery level, configure the Wi-Fi, enable automatic import from SD cards when they are inserted, and control other settings. Then to connect from your computer over Wi-Fi, you view the My Passport Wireless as a network drive to access the files on the disk and on an inserted SD card. For mobile devices, WD provides the My Cloud mobile app, free for iOS and Android. You can access the MyPassport drives, Downloads (files copied to the local device), and cloud services including Dropbox, Google Drive, Microsoft OneDrive, and WD's MyCloud.com personal cloud storage service. Then browse the selected drive, folders and files. As you browse, you can view files directly, Email or Print them, or use Open In to transfer them to another app. You then can manage files -- create folders, rename, delete, and cut/copy/paste. To transfer files between the different storage locations, use copy or cut (to move), and then browse to paste into a selected folder on the destination storage device and folder. Or to save an offline copy, use Download to copy selected files to local storage on the device. Similarly, when viewing a file in another app, use Open In to transfer the document to My Cloud's local Downloads, so you then can transfer it to the MyPassport or cloud drives. In this way, you also can transfer selected photos from the Camera Roll (but not from storage to the Camera Roll). The drive also is portable, at 5.0 x 3.4 inches, and 0.86 to 1.17 inches thick (depending on capacity). The battery supports up to 6 hours of continuous video streaming, and 20 hours standby. 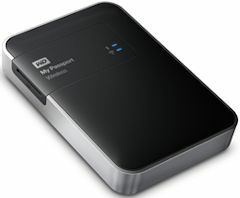 The WD My Passport Wireless is a robust tool to work with a large amount of storage across computers and mobile devices. It starts at 500 GB for $129, but is now available with 1 TB for around $169 and 2 TB for $199. With capacities up to 128 GB, your iPhone and iPad can collect and store massive amounts of data. But how can you share that data with others, exchange data with your computers, or (heaven forbid) back up all your information and photos and videos? One answer is to use Wi-Fi-connected storage like the Western Digital My Passport Wireless (see previous post) or the Kingston MobileLite Wireless G2 (see earlier post). These have the advantage of being able to connect to multiple devices over wireless to share and transfer files among a group. But why do you need to hassle with wireless settings at all? For laptops, we can just plug in USB thumb drives -- but this does not work with mobile devices like the Apple iPhone and iPod which do not have USB connections. But Apple's devices still do have a port -- the small Lightning connector used on Apple devices for the past few years as a replacement for the old 30-pin dock connector. It's used for power and for transmitting data, so why not use it for a mobile thumb drive? This is the idea for the SanDisk iExpand Flash Drive, which combines a standard USB thumb drive with a Lightning connector for use on mobile devices. The USB connector is on one end to plug into a computer, and there's a flexible Lightning connector on the side that you can bend out to plug in to your devices, even if they are in a case. Then install the iXpand Sync app to transfer files between the iExpand drive and your device. However, Apple's iOS devices organize applications by application, and do not have common storage with folders and files shared among applications -- so files are managed in different ways, depending on the type of file and the application that "owns" it. So you can start with the iXpand Sync app to work with the files and folders on the iExpand drive, to browse and copy/move/rename/delete. The app has built-in viewers for PDF documents and a variety of media formats that you can play directly. To move individual files to your device, you can use the standard iOS Open In feature to open the file as a document in the selected iOS app (which also transfers it to the device storage). And to move individual files in the other direction from your device to the iExpand drive, view the file / document in its app, and then use the iOS Send To / Open In option (supported in may apps) to copy the file to the drive with the iXpand Sync app. Depending on the file type and the app, you also may be able to use the Send To / Open In menu for other iOS functions, including Message, Mail, Twitter, and Print. For example, you can use this feature in Safari to dispatch some file types downloaded from the Web. Then to bulk copy/move groups of files from the iXpand drive to the device, select Save to My Downloads. This is local storage space on the device that is "owned" by the iXpand Sync app, which is used to collect files that you then can open in one or more other apps. Similarly, you can transfer in the other direction from My Downloads on the device to the iExpand drive. But for photos, iOS maintains tight control of photos and videos that you have shot on your device. The iXpand Sync app therefore provides the additional option to select groups of photos and videos in the Photo app's Camera Roll or other albums and bulk transfer them to the iExpand drive. The iXpand Sync app also provides backup capability. You can backup from the Camera Roll to to the iExpand drive, with options to sync only changes and to automatically sync whenever the drive is connected. You also can backup or restore your Contacts. For more security, you can encrypt selected files with a password into a special SanDiskSecureAccess Vault folder. 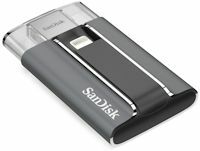 The SanDisk iXpand Flash Drive provides a great solution for transferring and backing up all those files you've accumulated on your iPhone and iPad. And the direct physical connection with the Lightning connector supports faster transfer rates than wireless. It's small and light (2.53 x 1.45 x 0.46 in), and available in capacities from 16 to 128 GB, priced around $82 to $149. Entries posted to Manifest Tech Blog in March 2015, listed from oldest to newest.